BAKSAN — Insurgents in the North Caucasus killed at least two security guards on Wednesday in a dawn raid on a hydroelectric power station, detonating bombs that suspended operations at the plant. The government is trying to contain an Islamist insurgency in the mainly Muslim provinces on its southern flank, but Wednesday's attack indicates that the rebels are now seeking to destroy economic infrastructure as well as targeting civilians. Four armed people attacked the Baksanskaya station, a plant in the Kabardino-Balkaria region run by state-controlled Rushydro, at about 5:00 a.m. Moscow time, shooting two security guards in a gun fight before laying several bombs in the turbine hall. "As a result of the explosion,s three generators and other technical equipment were put out of service," the Kremlin said in a statement. "The station's work was temporarily halted." 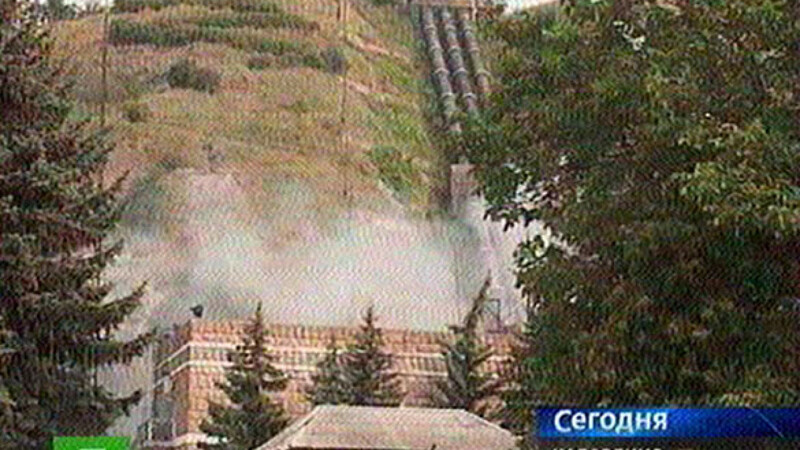 State television showed firemen fighting a raging blaze and smoke billowing above the dam. Local media said it took almost three hours to contain the fire that followed the blast. Rushydro shares fell 1.5 percent at the market's opening, but swiftly recovered and were up 0.25 percent above Tuesday's close by midday. "According to preliminary information, a terrorist act was the cause of the explosion and of the fire. Two guards died, two other people have been taken to hospital," Rushydro said. President Dmitry Medvedev has been informed about the attack, and Federal Security Service chief Alexander Bortnikov said security at major installations in the region had been increased, a Kremlin spokeswoman said. Analysts said the raid indicates that rebels were fulfilling their promise to target the country's economic infrastructure as part of their fight to create an Islamist pan-Caucasus state out of Russia's southern provinces. Chechen rebel leader Doku Umarov, who calls himself the "Emir of the Caucasus Emirate," has vowed to attack Russia's energy pipelines and power stations. Umarov claimed responsibility for the March suicide bombings in the Moscow metro that killed at least 40 people, and last year his group said it was behind a disaster which killed 75 people at the Sayano-Shushenskaya dam in Siberia in August last year. "I think this is a change in tactics," said Grigory Shvedov, editor-in-chief of the Caucasian Knot news site. "We should have been expecting similar attacks after the disaster at the Sayano-Shushenskaya hydroelectric power station," he said, adding that it was reasonable to expect more attacks on economic infrastructure. The Kremlin at the time dismissed the rebels' claim to have blown up the Sayano-Shushenskaya dam and officials said that the accident was caused by a sudden surge in water through the machine room, a conclusion most analysts agreed with. Baksanskaya is a relatively small plant built in the 1930s during the Soviet Union's industrialization drive. It has an installed capacity of 25 megawatts, which is less than half a percent of the capacity of the Sayano-Shushenskaya dam. Media reports said local power supplies were unaffected because energy was rerouted from elsewhere.